The Great Fire of London happened in Central London, 1666. The fire lasted for three days, from 2 September until 5 September. It is believed to have destroyed the homes of 70,000 of the 80,000 people that lived in the city. It is not known how many people died in the fire. Only a few deaths are certain, but for many of the victims there were no records. Also, the fire may have cremated many, leaving no recognisable remains. It threatened the aristocratic district of Westminster (the modern West End), Charles II's Palace of Whitehall, and most of the suburban slums. However, it did not reach these districts. The fire started at the bakery of Thomas Farriner (or Farynor) in Pudding Lane. It began just after midnight on Sunday, September 2 and grew very fast. Firefighters of the time usually made firebreaks by destroying buildings around the fire so it could not spread. This did not happen soon. Lord Mayor Sir Thomas Bloodworth, was not certain what to do. By the time he ordered such measures, it was too late. The Tower of London guard used gunpowder to make good firebreaks that stopped the fire from spreading to the east. The fire pushed north on Monday into the center of the city. Some people thought that foreigners were setting the fires. They believed it was the French and Dutch, who at that time were England's enemies in the Anglo-Dutch Wars. On Thursday, the fire spread over most of the City, destroying St. Paul's Cathedral and crossed over the River Fleet. It was close to setting fire to Charles II's court at Whitehall. The fire is said to have also helped to get rid of the Great Plague which had hit London in 1665, and killed about 70,000 of the 90,000 population, who may have died in the fire. ↑ Tinniswood, Adrian (2003). By permission of heaven: the story of the Great Fire of London. London: Jonathan Cape. 4, 101. ↑ Porter, Roy (1994). London: a social history. Cambridge: Harvard. , 69–80. ↑ Reddaway, T.F. (1940). The rebuilding of London after the Great Fire. London: Jonathan Cape. , 27. 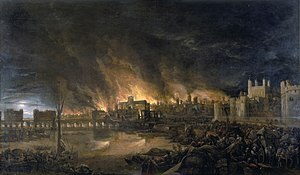 Wikimedia Commons has media related to Great Fire of London. This page was last changed on 18 April 2019, at 15:55.